The cervical neck pillow’s unique trapezoid center helps align the spine, whether you sleep on your back or your side. 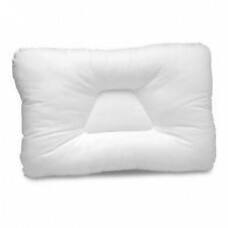 With your head cushioned and your neck supported, the Tri-Core Cervical Pillow helps alleviate everyday headaches, neck strain and other maladies. The Tri-Core is the fiber support pillow most recommended by the medical professionals who commonly treat neck and head pain. The cervical neck pillow, made with premium quality fiber, might even help alleviate airway blockages, a major cause of snoring. The Tri-Core pillow is available in mid-size options, providing the same type of support for children and young teens, as well as for smaller- and average-size adults. DUE TO THE PERSONAL NATURE OF THESE PRODUCTS, ALL BED PILLOWS CAN NOT BE RETURNED FOR REFUND IF PLASTIC BAG IS OPENED.